The grand opening date was revealed at an event outside the casino, which is located on the Mohawk Harbor site along Erie Boulevard. Casino executives and local leaders popped champagne and celebrated the announcement as a milestone for the region. The most recent estimate for the opening had been for March. The del Lago Resort Casino in Tyre, Seneca County, New York, has announced a February 1, 2017 opening. (By the way, earlier this month, del Lago made a $100,000 donation to promote workforce diversity) The Tioga Downs Casino, in Nichols NY, which has expanded from its racino status, opened as a full casino on December 2, 2016; the Montreign Casino, at Monticello NY, is expected to open in March 2018. 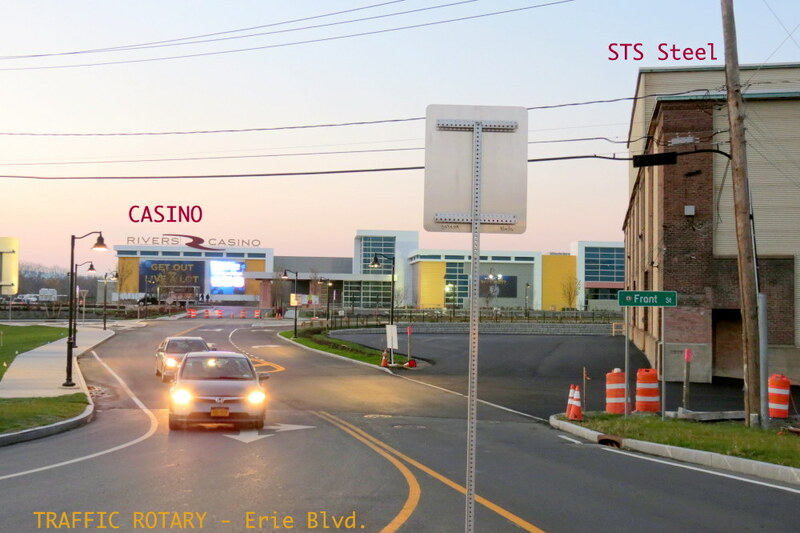 As we pointed out often at this website and in submissions to the Planning Commission and City Council, Rush Street and Galesi were clearly misleading our community when they insisted that the Casino could not be seen from Erie Boulevard, because the STS Steel building was in the way. (see, e.g. 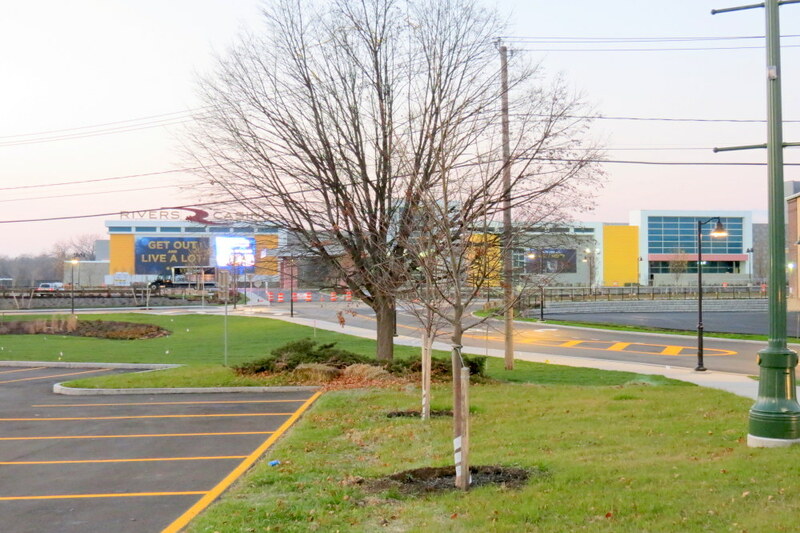 our posting “phony pylon excuse“) The invisibility of the Casino and its rooftop signage from Erie was the excuse given for the demand that Rush Street be able to erect an 80′ x 39′ pylon sign structure. City Council and the Planning staff and Commission never challenged that bold claim, and changed the Zoning Code to accommodate such a monster pylon (which Rush Street has never promised not to build). If they were willing to deceive on something so easily shown to be untrue, what other misleading claims has the Casino Gang made? Revenue projections? Traffic flow?
. 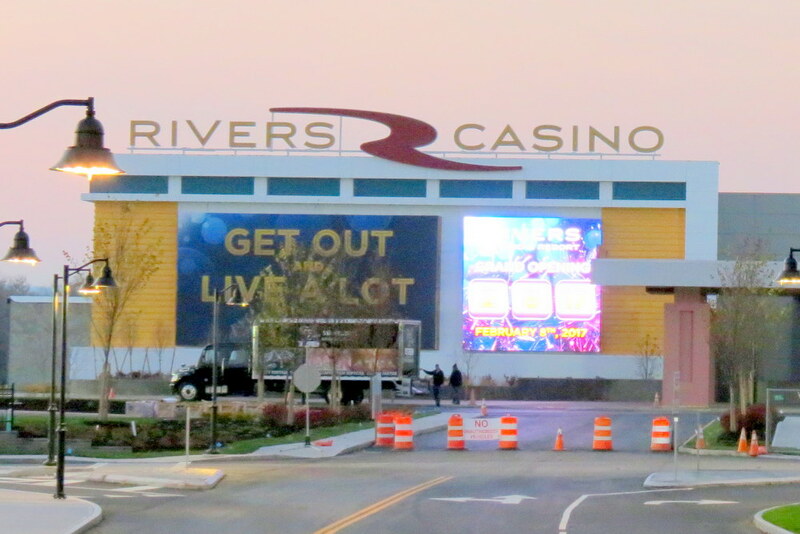 . . above and below: Rivers Casino viewed from Erie Boulevard . ..
follow-up: We felt a strong need to comment on the fact that February 8 is the anniversary of the Schenectady Massacre of 1690. See our posting “Schenectady’s infamous February 8th“. 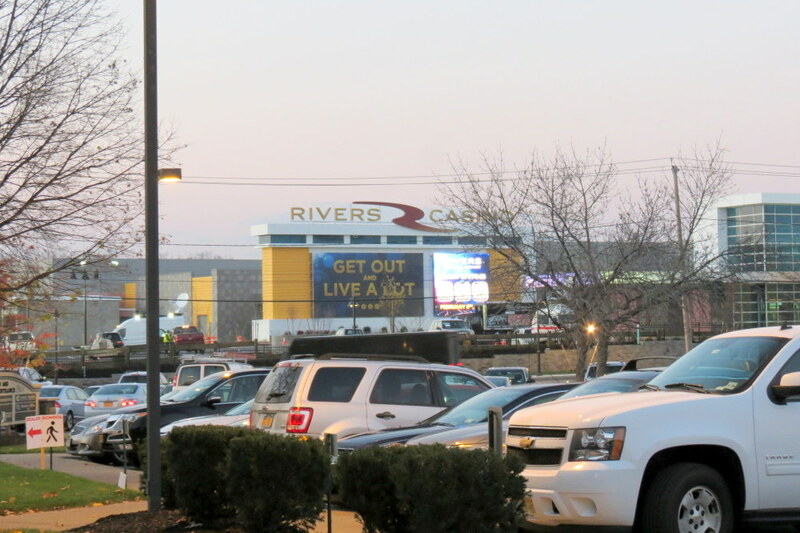 This entry was posted in Schenectady Casino and tagged Rivers Casino, Rush Street Gaming, Schenectady Casino by David Giacalone. Bookmark the permalink. We can build a casino in less time then it takes to investigate a fire, the car chase involving the Mayor is about 6 months old, fast catching up.